Instead of the traditional turn-the-date-over monthly calendar, I put up all 12 months, to create a living document of our year. It was a learning curve as the kids and I figured out together how we wanted it to work. First thing that went up was all the birthdays. Pretty important. I wanted the kids to see the passage of time. The whole school year - not just the current month. 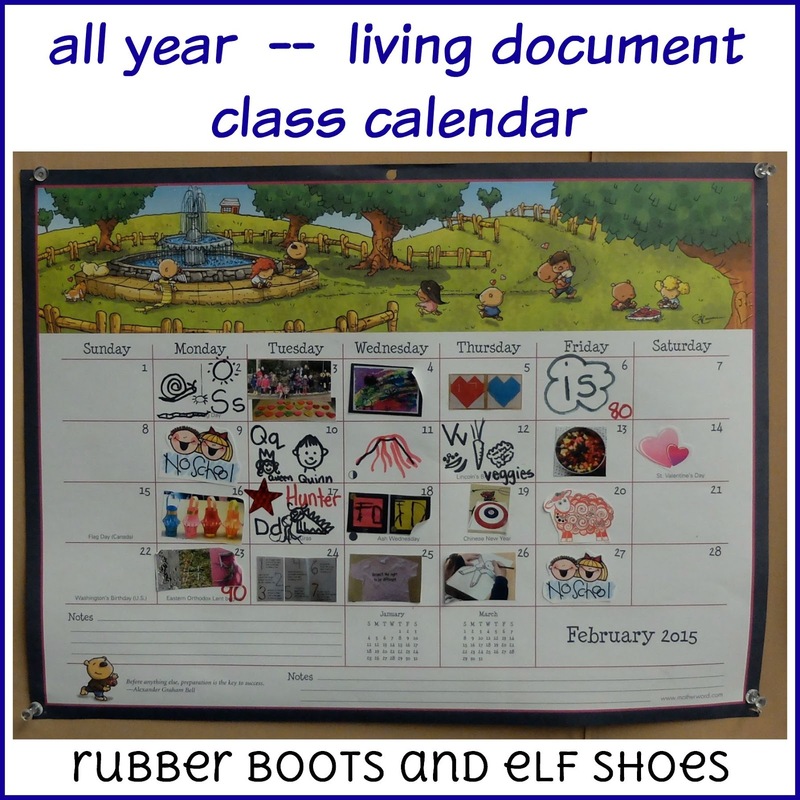 I wanted to the kids to refer to the class calendar the way that I use my calendar at home - to see when events were going to occur. The kids wanted to fill in each day's square with "something important" that had happened during the day. I regularly heard, "Ms Sandi, take a picture of this to put on the calendar". Sometimes we had to decide together what to put on the calendar. Sometimes we worked backwards; on the 110th day of school, they decided that they wanted to record every 10th day of school. Sometimes we glued new pictures on top of old pictures. 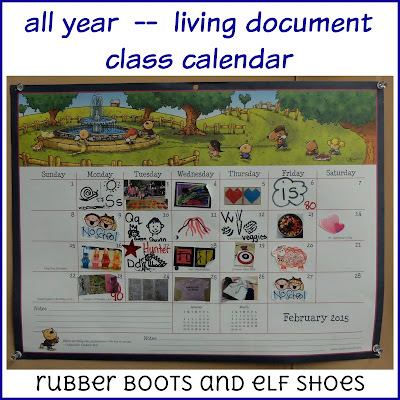 It was the kids' calendar and was a living and changing record of our kindergarten life. 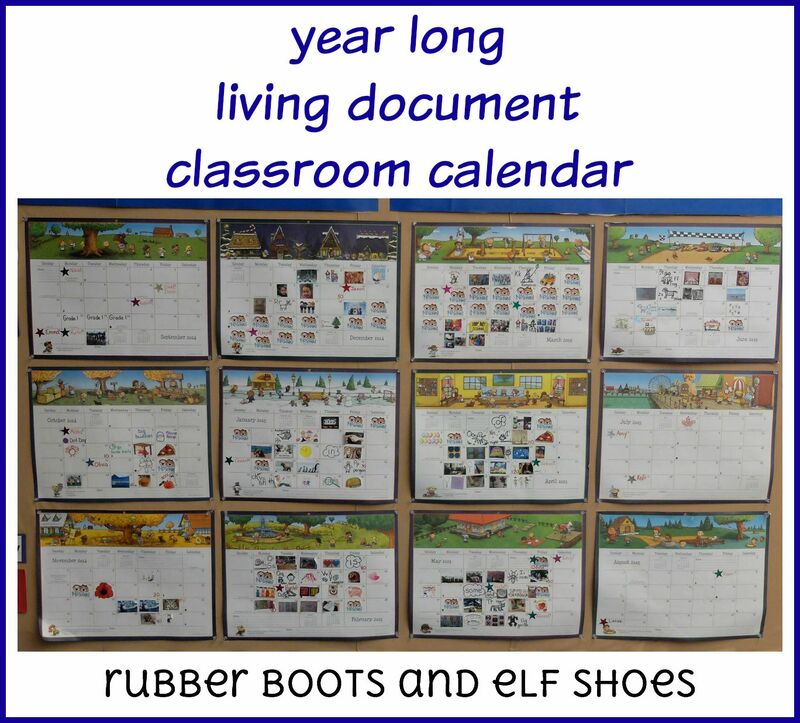 The calendar became a classroom resource. The kids used it to see when birthdays are. Because birthdays are important. They also used it to count days to events as well as referring to it when chatting with each other about class activities. Parents referred to it to see when we had Pro D days or early dismissals or class events. Parents chatted with their children, asking them about the pictures on the calendar. It became a vehicle for families to chat about their children's kindergarten lives. I used it for planning. I could see where we had been, and map out where we were going while seeing all the planned events quickly and easily. I like the Mom's Planning Calendar. They have a friendly picture on the top, the boxes are a decent size and they show when there is a full moon (in case I did not already know - ha ha!). Last year I found that the name of the month got "lost" in all the other text and photos. 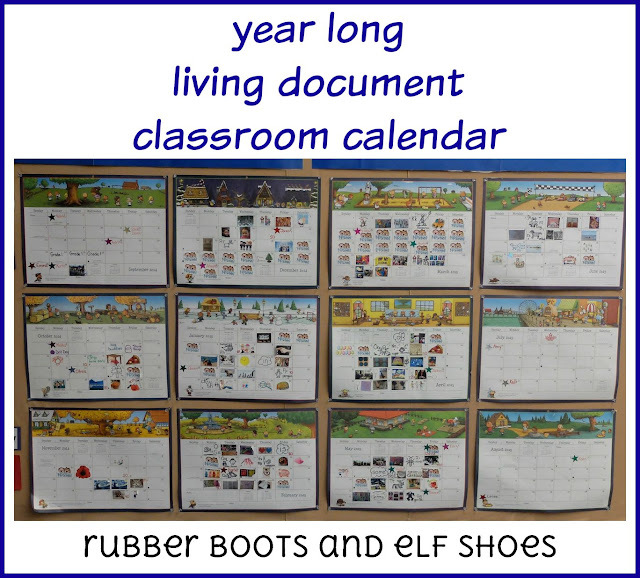 This year I printed out the months and mounted them on the same colour heavy bond paper. Hoping that they will be easier to find. This year's calendar is up and ready to go. Looking forward to how our new year unfolds and how we choose to record it. okay that's just really cool. I toyed with the idea of changing my calendar but didn't get very far. I like how you arranged all the months like that. My main problem is space. I'll have to figure out where I could put them all! I had to change around my calendar area and take away a pocket chart. 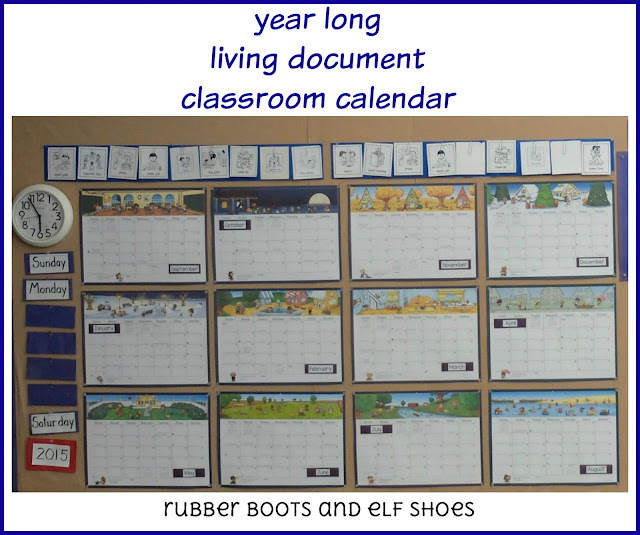 While I do miss the pocket chart for interactive reading, I feel that the wall space investment in the year long calendar is worth it. Great idea and much more connected to real life.